It's still winter, right? At the beginning of March, many people in colder areas of the Northern hemisphere have probably had enough of winter. But here in Dubai I cherish every day, where temperatures stay below 25C by noon, as this is winter to us. You may say, that 25C does not qualify as winter. However, I have been craving winter vegetables and I am going to squeeze my winter vegetable recipes into my blog as soon as possible, ideally before the official start of spring. So get ready for cauliflower, Brussels sprouts & Associates. Today's recipe is hardly a recipe. It's more an irresistible combination of flavors and textures. The two stars of the show: cauliflower and sage. Both roasted. 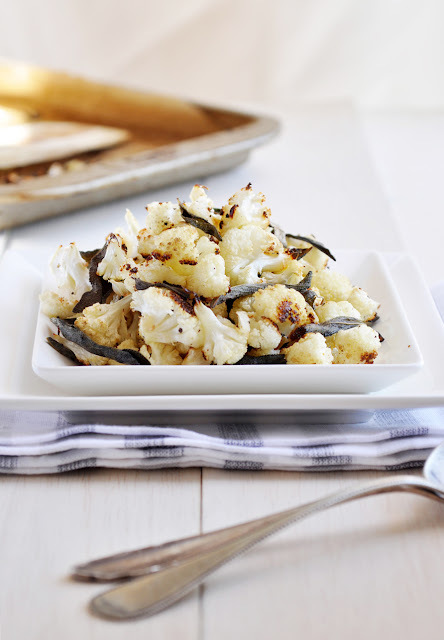 Cauliflower keeps its sweet and mild flavor much more when roasted. Opposites attract, that's particularly true for the culinary world. Now add bitter and pungent sage to it, and you have the most amazing vegan side dish or salad. What makes it even better is that the sage crisps up while roasting. I am in love with this dish, and have no problems eating a whole cauliflower with sage alone for lunch, as I did today. The health benefits of cauliflower and sage are enormous: cauliflower is full of vitamin C and antioxidants. Sage is also full of anti-oxidants, vitamin K and both have anti-inflammatory abilities. Two superfoods combined and one of the easiest dishes to cook. It only needs some chopping and tossing, and it will roast peacefully and all by itself in the oven. Bon Appetit. Cut cauliflower into bite-sized florets. Toss in olive oil and season with salt and pepper. Mix in the sage leaves. Spread out in one layer onto a shallow baking sheet and roast for 25-30 minutes, stirring and tossing occasionally, or until tender and slightly browned. Transfer to serving bowl. Serve immediately.